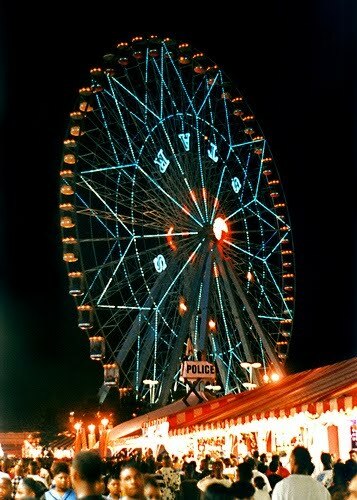 First published on the Oxfam blog here. It is the year 2060, I am 72, and I hate to say I told you so. London is underwater, like Bangkok, Cairo and Shanghai. Venice too, but that was a given, and whole countries, Bangladesh and the Maldives. World population is said to have peaked, at 9 billion, coinciding with the 4C temperature increase that has drowned whole swathes of continents and scorched others. Just as in the century preceding it, 2060 has produced winners and losers. In 2010, I attended the Independent Live climate change debate ahead of the United Nations meeting in Cancun. Sponsored by Shell and Channel 4, the fate of any progress on international legislation was unhelpfully sealed by our Chair in his opening riposte. “It is accepted that no agreements will be made in Cancun,” Mike McCarthy, Independent environment editor said. He added: “As for the US, Mr Obama’s pledge to cut emissions by 17 per cent last year was predicated on the US Congress agreeing. I pressed him, asking if the matter was so urgent, life and death, couldn’t we, the UK, the West make the first move, leave the Chinese behind for now if we had to? During the debate, they spoke of the technology being ready, but for the political will. And so we left it, all in agreement, but without dynamic leaders, with little conviction. 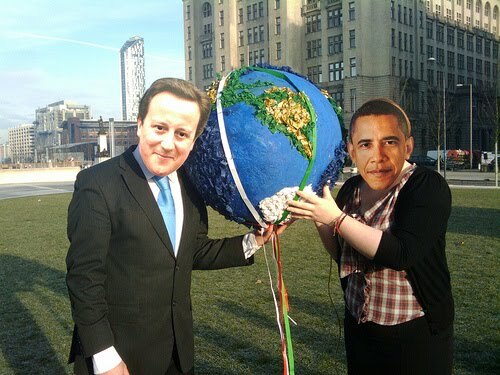 MARGJIN, a coalition of charities staged the picture of David Cameron and Barack Obama with the world in their hands in Liverpool. If only these men had convinced others of the urgency. For a fantastic comment on how the left of the media feels about Cancun, check out Johann Hari of the Independent, buried inside the newspaper like much of the coverage of the most destructive issue facing our generation. Is it irresponsible to leave the decisions down to government, to passively report, when so many lives are at risk? Young people in Canada are frightened. Liverpool Oxfam society is hosting an event called ‘1.4 Billion Reasons’ on Monday from 7-9pm in the University Lecture Rooms Building about all the people already living in extreme poverty. This entry was posted in Barack Obama, Channel 4, David Cameron, Johann Hari, oxfam, poverty, Shell, The Independent on November 29, 2010 by kirstystyles1. On Sunday I caught up with The Apprentice, which I regrettably missed, but was instead at the Independent Live climate change debate. Sponsored by Shell and Channel 4, the fate of any progress on legislation at the next UN meeting in Mexico was unhelpfully sealed by our Chair in his opening riposte. On the X-Factor, Wagner was reprimanded for saying that Cheryl Cole gives hope to people from council estates. No doubt she is a role model, if a ‘better life’ is questionable singing and having your every move theorised. But in our free and fair democracy, it shouldn’t take a TV show to give the public hope. Ahead of the Government white paper on education, we knew that education maintenance allowance for all but the most disadvantaged young people was being scrapped, along with funding of Connexions advice service, AimHigher and school sports. A nation-wide protest by students yesterday followed an initial demonstration in London. While debates about student fees are necessary- surely a tripling of fees can only be justified by a tripling in the quality of education- graduate tax or fees hike, the same people are still shut out of higher education. Of 300,000 young people who got three new A* A levels this year, just 149 of them, 0.05 per cent, were eligible for free school meals. Some children are two years behind their peers when they get to school, not toilet-trained or able to speak, and many never catch up. It is hard not to notice that those with ‘top jobs’ attended a few elite institutions. Stephanie Flanders, BBC economics editor was in a tutorial group with Yvette Cooper, our foreign secretary, studying Politics, Philosophy and Economics at Oxford. Both went on to the Financial Times, where both, according to the Daily Mail had a relationship with Ed Balls. Who too studied PPE. Ms Flanders is also said to have had a fling with Ed Milliband, who, you guessed it, went to Oxford to study PPE. Do we all really want a 24-hour life where your dirty laundry is aired for all of middle-England to see? As long as everyone has the chance to get to Oxbridge if they want to, then there isn’t a problem- just as David Milliband might have enjoyed working as a librarian. The words ‘university’ and ‘education’ have become synonymous, interchangeable and this is devaluing the alternatives. Polytechnics taught different skills from universities, just like apprenticeships, entrepreneurialism and practical college courses. While the degree too is worth less as more institutions offer them without rigorous academia. Our slip in international league tables, and the coalition’s new commitments to core subjects and improved teaching outlined yesterday show the extension of higher education hasn’t actually improved outcomes. Some courses are a money-making scheme, ‘attractive sounding’, and many graduates end up, at least in the short term, working in unskilled jobs. The words ‘fund my future’ were scrawled lazily on student banners at Demo2010, but if people are led, with ignorance, into degrees that aren’t good enough, other people won’t pay for them. Theresa May has decided not to legislate on equality, favouring a voluntary commitment (?) from public bodies to promote equality. Equality of opportunity, not equality of outcome, highlighting ‘fairness’ over ‘equality’. Who couldn’t favour equality of opportunity? We don’t need a workforce of professionals or semi-skilled labourers, lots of ice-cream men or brain surgeons, people achieving the same outcomes, we need lots of things. A silent majority, however, has their future compromised long before. Their fate sealed not when they come home without a raft of ‘top grades’ at GCSE and A-level, but maybe even, when they are toddling naïvely to their new drawer. Ahead of the UN climate change conference in Cancun, despite evidence released daily that our emissions will lead to a climate disaster with people in the developing world already suffering, we are waltzing into oblivion anyway. If everyone is allowed to go on a ‘journey’, university without regard for the usefulness of the degree at the end of it, we will slip further, and not produce the scientists needed to address and communicate the world’s increasingly complex problems. And if we continue to wee all over the issues: ‘we want this’, ‘we want that’, then a sustainable world is not the only challenge we won’t be facing. There will be a real lost generation of undereducated, isolated and angry people- without banners, and warm homes to go to, but far worse. Life is unfair, but it is more unfair for some people than others. This entry was posted in aimhigher, cancun, cheryl cole, climate change, connexions, deprivation, poverty, sustainability, tuition fees on November 25, 2010 by kirstystyles1.